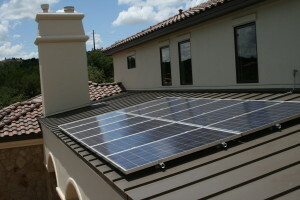 The cost of solar energy has dropped so much that the Pedernales Electric Cooperative (PEC), the nation’s largest electric cooperative, which serves a large area to the west of Austin, has announced a plan to significantly expand investment in this clean, affordable energy source. The measures adopted will encourage development of both large- and small-scale renewable energy, primarily solar. For large-scale developments, the co-op will work with its main power provider, the Lower Colorado River Authority (LCRA), to continue expanding the diversity of its generation portfolio with the addition of wind and solar resources. Utility-scale solar prices are now lower than electric prices from natural gas-fired power plants, with the added benefit of being fixed in price for 25-30 years. Locally, the co-op will also build 30 megawatts of medium-sized solar installations, to be strategically placed at distribution stations and in locations near its biggest customers. Some of these installations will be open member subscription through a new community solar program. The co-op will also establish an on-bill financing program that will provide low-interest loans to assist customers with the up-front cost of on-site renewable (primarily solar) energy projects. The strategies adopted are intended to help the co-op reach its 30 percent renewable energy goal and expand the use of distributed local solar while maintaining affordable rates. PEC places a strong emphasis on reliability, providing excellent member service and keeping rates low. Favorable renewable energy prices and a changing energy market that increasingly includes customer adoption of solar allow the co-op to meet all of these goals at once. The co-op also just recently reduced electric rates for customers. As water constraints continue in Central Texas, transitioning to renewable energy sources will help preserve precious water resources for domestic consumption that are currently allocated for energy production. Wind and solar are drought-proof energy sources that require little or no water to operate. PEC’s move to embrace solar puts the co-op in good company. The City of Georgetown recently announced a large new solar contract that would help the city be powered by 100 percent renewable energy by 2015.